The Made Up initiative seems to be going from strength to strength. The good news is that at the time of writing, the total has just skipped past the £2,000 mark, which is almost double the initial target! Hoorah! The slightly less good news (for me, anyway) is that we've also skipped past the halfway point to the deadline. Hmmm, I think a bit of a progress report is needed…. Considering I have to fit my sewing in between fairy cake making and regular trips to the swimming baths (shudder), I don't think I'm doing too badly. Everything will rev into gear soon when the boys go back to school, but in the meantime, there's plenty of prep work to be getting on with. The one major change I've had to make to my plans is that my 1930's blouse will now be sleeveless. This is partly down to me stubbornly insisting to myself that one metre was enough fabric and partly because of the fabric itself. It was only after washing and ironing the fabric (more on that in a minute) that I realised there was a sizeable chunk missing from one corner - a 7" x 5" rectangle to be precise. It took me ages to work out what this was, then I remembered - a couple of hours before I'd actually purchased the fabric I'd asked for a sample, and the hole was the sample I'd been given. I wouldn't have minded if I'd been given a bit more to play with, but my fabric still only just measured a metre in total. 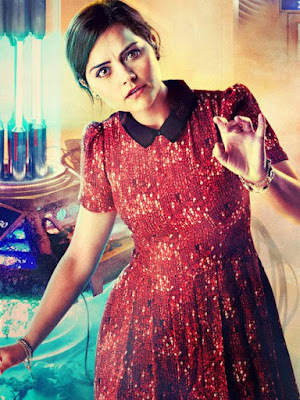 In fairness, this may not have been intentional, but all the same, it was bloody annoying and meant I had to omit the sleeves. Whinging aside, the pattern pieces have been cut from the fabric, so the fun's about to begin! I got to use my razor sharp serrated edge scissors for the first time and they were fab, they made the cutting so much easier, thanks Alex for the recommendation! I had to make a couple of tiny adjustments to the yoke and to the front and back bodice pieces to allow for lack of sleeves. 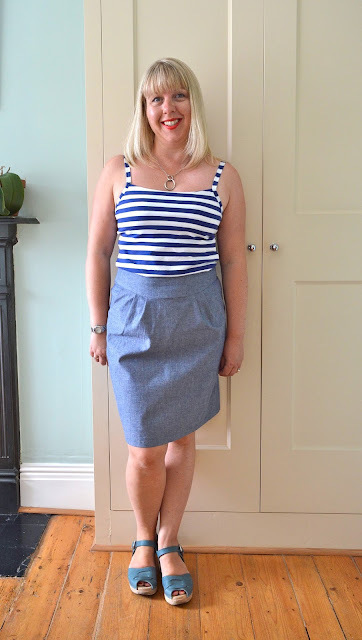 I used this tutorial, the same one I used to convert my Granville to a sleeveless version, and it worked fine. I also decreased the back width slightly, which is an adjustment I made on my other versions. As I didn't want to take any chances with silk crepe de chine i.e ruin it in the wash before I'd even taken the scissors to it, I did a bit of research on how to launder silk. This involved asking my regular laundering guru - my mum, Lily. Lily's advice was to gently wash the fabric in lukewarm water with a very mild soap, no rubbing or squeezing, just swirl it around. Then rinse it well, smooth it out and lay it between a towel to dry flat. This is more or less the same advice given on the Til the Sun Goes Down website, so I knew it was sound. It washed beautifully, but it was a bugger to get the creases out of. I pressed the fabric whilst it was still damp, but they were still pretty stubborn. It's definitely NOT going to be an easy care garment! I've now underlined the front, back and yoke pieces with white silk cotton to brighten the colour and make the silk less transparent. Even with the underlining, the fabric has still retained its silky hand and slight sheen, which is encouraging. My next step is to interface the under collar and front button band with silk organza to add a bit of crispness. I'm using silk thread to underline and to sew the actual blouse, along with a sharp needle and Entomology pins. If you're interested, my silk thread came from here, which offers a much wider choice of colours than Gutermann silk thread. I also have some vintage silk thread in exactly the right colour (see photo above), but sadly, not enough. Aren't the old thread bobbins so much more attractive than the modern ones?! 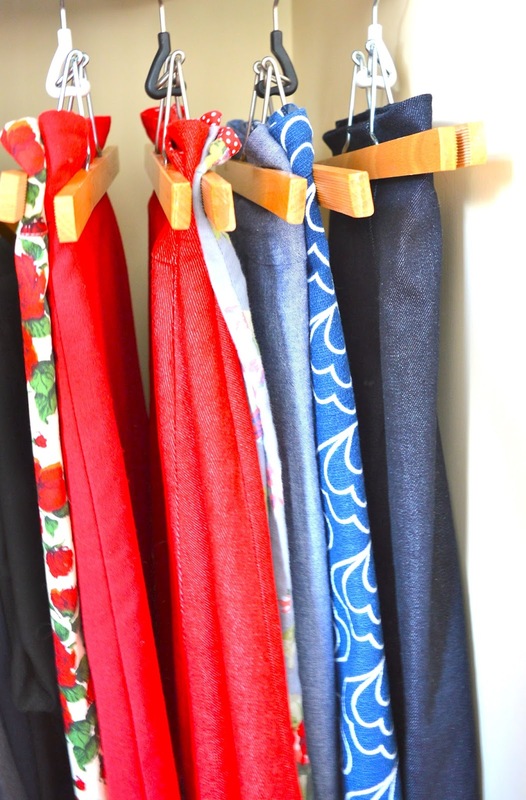 How much of your handmade wardrobe do you actually wear? Somebody recently described the size of my handmade wardrobe as vast. This came as a bit of a shock to me, as I consider my wardrobe to be pretty minuscule, especially compared to some of my non-sewing friends. But if you scroll through the My Handmade Wardrobe page on my blog, there are, in fact over 100 garments listed. 110 in fact! 110!!!!! I then went through the entire page, checking which garments were still in circulation and which had been slung out. The results were quite interesting…. First off, I need to explain my position on hanging on to things - I'm absolutely ruthless, ruthless. I dislike hoarding, and this applies to everything apart from books (which I'm constantly tripping over). 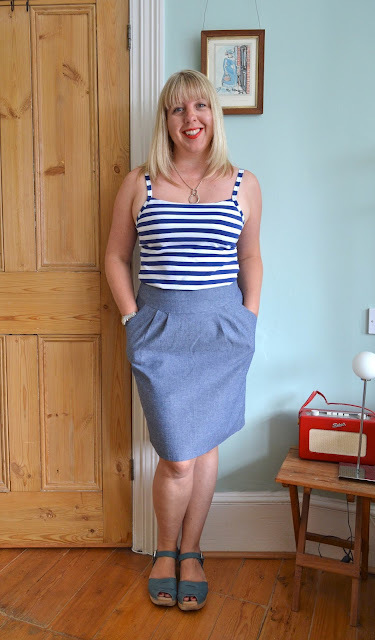 I have regular pattern and fabric culls and the same is true of my clothes - apart from a few items that have real sentimental value, there are very few clothes from years gone by that I've actually kept. My rule is simple: if it hasn't been worn that year, it goes. Sometimes I extend this to two years if I really think I'm going to wear it, but not very often. Local charity shops do very well out of me come the changing of the seasons! It seems that two thirds of my handmade garments are still being worn, but that still leaves a good chunk of them that have gone. I've given a few garments away in giveaways, several have died peacefully after being thoroughly worn to death, but the majority have been given to charity. What's really interesting is that the number of garments I've got rid of have become fewer and fewer as I've progressed through my sewing life. For instance, all five garments from my first year of blogging (2010) have now gone, but last year I only got rid of one item: my first Afternoon Blouse (which I loved, but it was just too tight to be comfortable). How about you? Are your handmade lovelies imprisoned in your wardrobe, destined never to see the light of day again? Or do you wear the whole lot on a regular basis? I'd love to know! 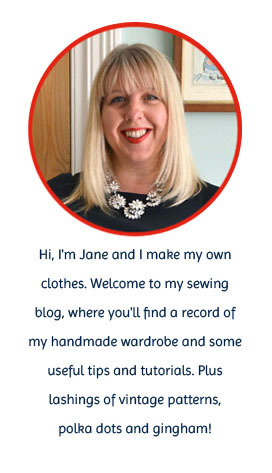 I'm very excited to help spread the word about the Made Up initiative, the brainchild of Karen at Did You Make That? The initiative - which launches today - is in support of the National Literacy Trust, a charity dedicated to raising literacy levels in the UK. But how does it work? Well, like all the best ideas, it's a simple one and it combines two of my great passions: sewing and reading! Readers of Karen's blog are invited to donate an amount of money to the National Literacy Trust via Just Giving. In doing so, they pledge to sew, make or otherwise create something to a deadline. It's as simple as that, all you need to do is donate and get sewing! As an added bonus, all finished creations that meet the deadline of September 10th are automatically entered into a fab prize giveaway worth over £300! The Made Up initiative is a wonderful idea and one that's very close to my heart. I was brought up in a book loving household and could read before I started school, thanks to the patience of my mum and a set of flash cards. That was just the start of a lifelong love affair with books. I'm always reading, always, always, always. I couldn't wait to start reading to my sons when they were born and happily, they've both turned out to be book lovers too. I was lucky and my children are lucky, but this isn't the case for every child, which is why raising money for the National Literacy Trust is so important. I'm delighted to be able to support this venture through my love of sewing, even if it is on a small scale. It's also an excellent opportunity for the sewing community to come together and make a real difference. The big question is, what to make?! I must admit, the timing's not ideal as it's still the school holidays for a couple more weeks, but I like a challenge…! So I've decided to stretch myself and finally start work on my 1930's crepe de chine blouse. 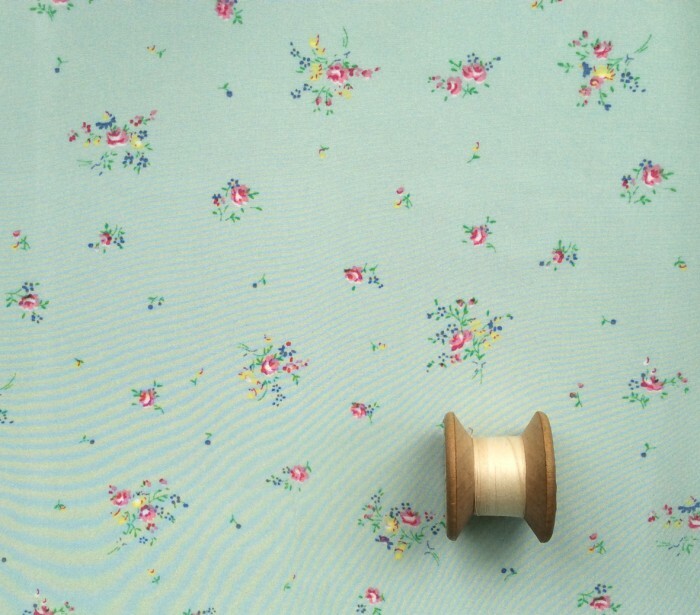 I'll be using my beautiful aqua posy fabric from Til the Sun Goes Down and this 1930's blouse pattern. Further details about the Made Up initiative and a list of the amazing giveaway prizes can be found at Did you Make That? Donations can be made on the Just Giving page. 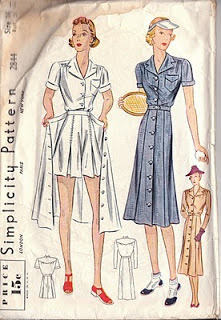 Ah, lovely Simplicity 2451! Gorgeous incarnations of this pattern have been popping up on my radar for years - here, here, here and here - the last one even uses leather rescued from one of my old skirts! 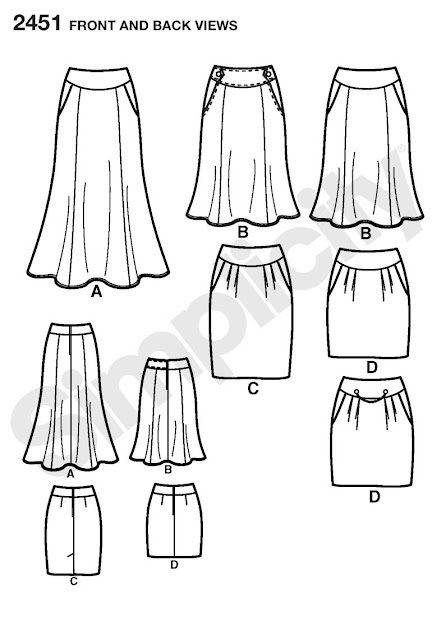 Despite admiring the skirt greatly, I always disregarded it as a pattern to wear myself as I didn't think the tulip shape and front pleats were really me. Wrong! 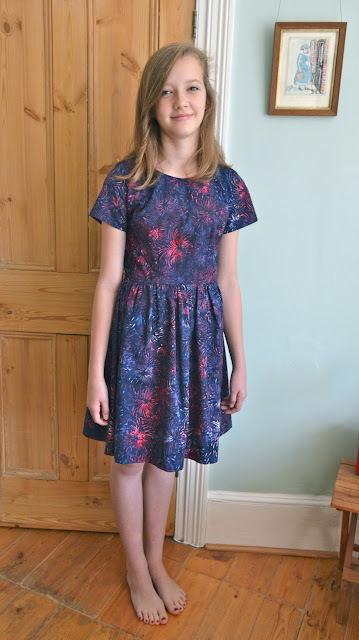 After making my Anna 6696 dress last year and having to add waist gathers out of necessity, I've since become a convert to a bit of extra room in the front! 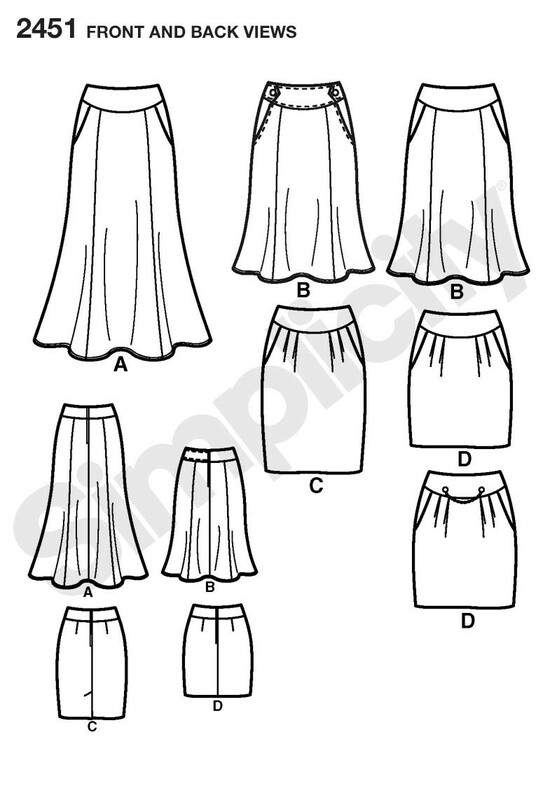 So when I was in need of a simple, easy-to-wear summer skirt, this pattern came calling. 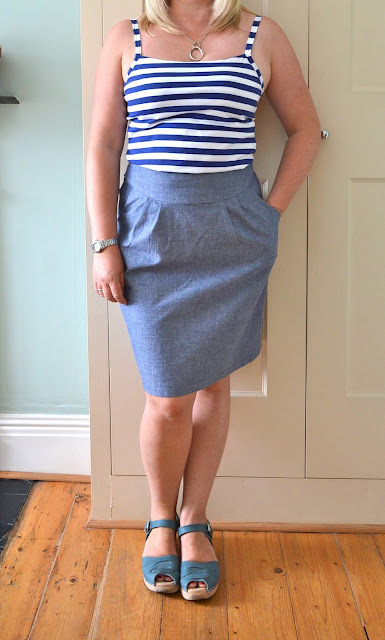 For fabric I used some lovely Andover Chambray in Indigo from The Village Haberdashery. I can't link to it I'm afraid as I bought it as a bolt end. 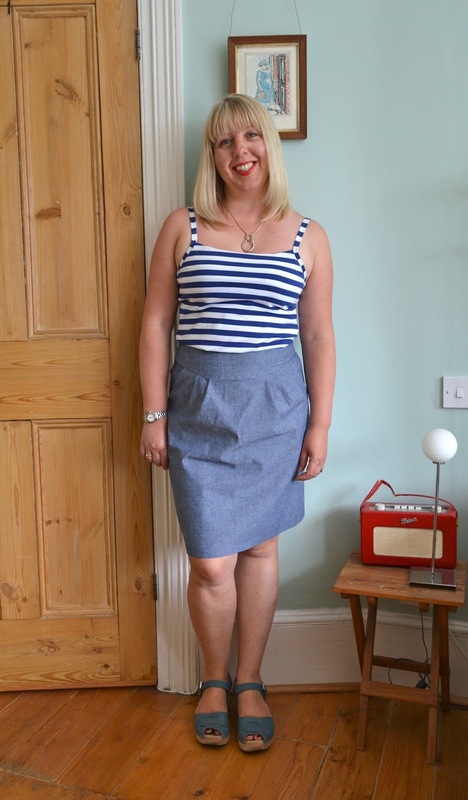 The piece was 115cms long and it was just enough for this skirt. The chambray is lightweight but still crisp enough to hold a pleat and was very nice to work with. It's also a great neutral colour and matches almost everything I own - which is handy! The pattern includes some interesting design details such as a curved waistband, pleats to the front and slash side pockets. These details add a bit of interest to the skirt but it's still relatively easy to sew together. The instructions were perfectly clear and I sewed it up in an afternoon. The only two changes I made were to substitute a lapped zip for an invisible one and to eliminate the back vent. Based on feedback from other reviewers I went down a size from my actual measurements, cutting a size 12 of view C. This turned out to be a wise move and the fit is great - it sits lower on the waist than I'm used to which makes it super comfortable to wear. Long time readers of this blog will know that unselfish sewing is not normal behaviour for me. I find fitting and sewing for others far more stressful than sewing for myself and avoid it like the plague. 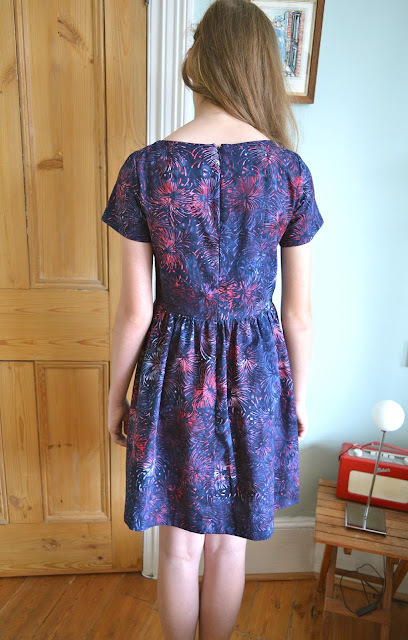 But I couldn't say no to my latest project - a dress for my friend's daughter Emily. I first met Emily's mum Sophie when our children were just a few weeks old and she's since become one of my closest friends. Because of this I have a real soft spot for Em and when Sophie asked if I could make her a dress, I agreed at once. Emily was inspired by the dress below, worn by Clara from Dr Who. She wanted to keep the fitted bodice and full skirt, but preferred plain, short sleeves rather than the gathered ones in the photo. She also decided against the collar. After a consultation with my Twitter pals regarding pattern choice, the general consensus seemed to be the Christine Haynes Emery dress. Emily liked the look of the pattern too, so we got to work. 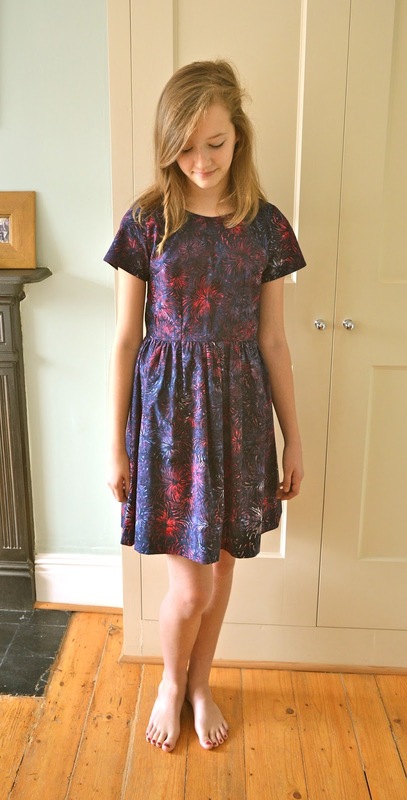 For fabric, Emily chose this unusual navy and red firework print from Island Batik. 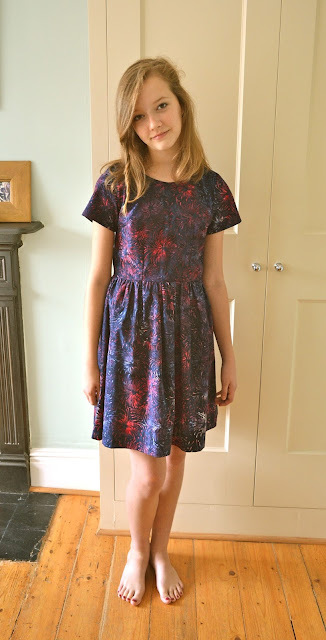 We found it after researching 'firework prints' online and she fell for it immediately, preferring the navy and red colourway to Clara's original red. I couldn't find any UK stockists, so had to order from Fabric.com in the US. They've since sold out, but there's still some available here, if anybody's interested. The fabric is a medium weight quilting cotton and quite crisp to to the touch, even after a pre-wash. This actually worked in our favour and was a good match for a structured pattern like the Emery dress. The bodice is lined with a navy cotton muslin. There's still a fair bit of wiggle room built in, to allow for growth spurts! I also left a generous three inch hem on the skirt for the same reason. I'm absolutely delighted with the finished dress and, more importantly, so is Emily! 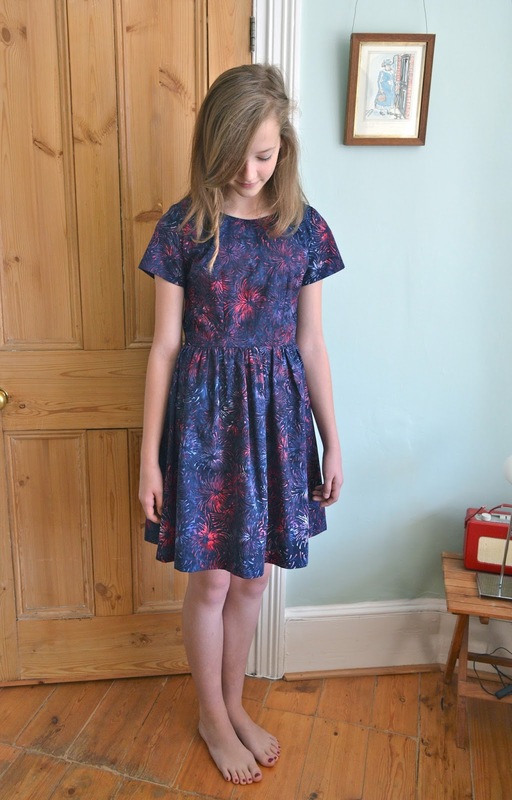 The dress has a very simple shape but I think the unusual fabric really elevates it into something special. She looks so pretty and elegant in it and so grown up! It doesn't seem that long ago that Sophie and I were taking her and Louis on their first walk - they were so SLOW, nearly an hour to walk from one end of the road and back!